this giveaway is sponsored by Dunia Kutek and open for Indonesia citizens only. Read more to know about the rules and amazing prizes! The giveaway is open for everyone who are based in Indonesia! And there will be 3 winners to win awesome prizes! 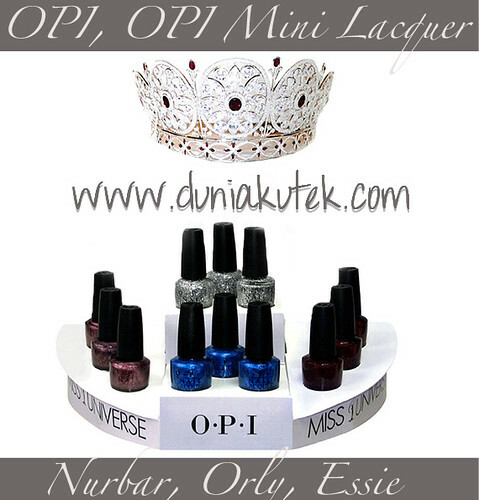 Dunia Kutek sells the regular OPI Nail Polish for IDR 125.000 each. but if you mention that you know her site from me, you can enjoy 10% discount of your purchase. Normally it will cost you for IDR 180.000 each on the counter. so its such a bargain! So, how to win the awesome prizes?? Comment only once! All the winners will be chosen randomly. The more rules you follow means the bigger points you collect, so the higher chance for you to win these amazing prizes! This giveaway runs from 1st September to 25th September 12A.M. So good luck everyone in this giveaway, I hope you would enjoy it! Awww, good luck at winning this contest Stella! 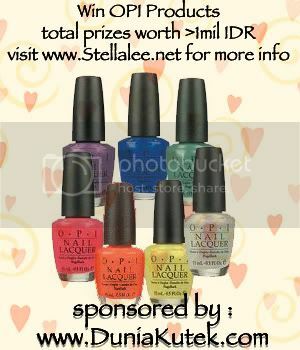 The prizes look amazing and I wish I could enter but I realize it's for Indonesian residents. YAY Opi has great polishes! Good luck! I have to admit that I'm so eager to participate in this giveaway. I've never had OPI before. So, I'm so excited!! Done all the task and I really hope i can win!! Shades from OPI that Iâ€™d like to try = OPI Gold, Purple, and Silver shatter, and also OPI Serena Williams Glam Slam. Oh my God, I am really sorry, I accidentally submited my unfinished comment, I forgot to mention my name, email, and url. Just delete my anonymous comment. :) I already submited my complete comment below. Shades from OPI that youâ€™d like to try = Cogeniality Is My Middle Name, Road House Blues, Honk If you Love OPI. hi stella,thanks for visiting my blog, and your sweet comment. Shades from OPI that youâ€™d like to try = Skull & Glossbones, Honk if you love OPI, Fiercely Fiona, Who the shrek are you, Zom-body to love.